A majority of the market has gone to textural designs featuring sometimes only one flowering plant or a unique foliage selection. This is an great trend as it’s going to be considerably easier to keep the container looking cleaner longer! Limited plant placement means saving time dead-heading to prevent disease or to promote blooming. Monochrome containers are trending largely on Instagram, and Pinterest. Selecting plants in all the same colors or tones can create a dramatic appeal. 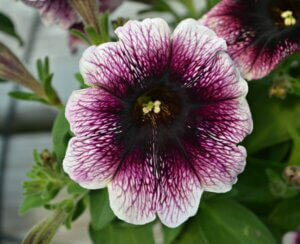 Consider using dark foliage and even darker blooming flowers! Black and grey are becoming huge in giving a lot of backdrop for over-sized designs. Black Colocasia, black Petunias, bronze leaf Canna lily, Mocca Begonias; all give a large statement either as a centerpiece or accent. Don’t discount the use of grey to pull out a more saturated look from your colors. Dichondra, lotus vine, lavender, artemesia can be used in monochrome designs that are looking for the break in the different shades. The immense rise of Instagram has changed the speed at which container gardening as exploded. 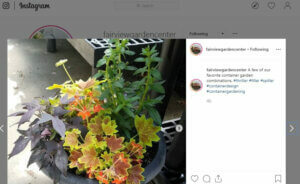 This allows us to view hundreds of thousands of pictures of inspiration and decide the colors and textures we like long before we go into the garden center. There is no shame in getting ideas from Instagram! It is the same thing as going into a hair salon with pictures of what you would love your dream haircut to look like. If we do not think that the combination would work in your space, we have alternatives that will give the same impact. Color variance advancements have given us the ability to have nearly every shade of color for all conditions we are planting in. 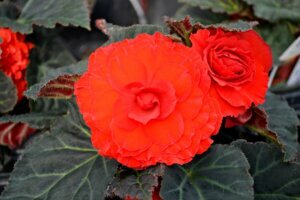 Tuberous begonias alone have colors in the deep reds, yellows, and oranges. As well as having some of the most interesting foliage possible for shade environments. Remember that it’s not always all about the plants. Selecting the right container is just as important as choosing the best plants. Think of the weight of your container! When we put the soil and plants in a clay pot and then water it all in, they can weigh an exorbitant amount. So think of using acrylic containers that are considerably lighter and yet given a very nice sheen, plus do not chip or crack as easily as pottery can. The experts at Fairview are here to help. 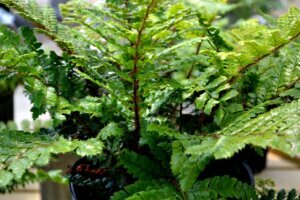 We’ll help you choose the right pot and plants for your specific needs!